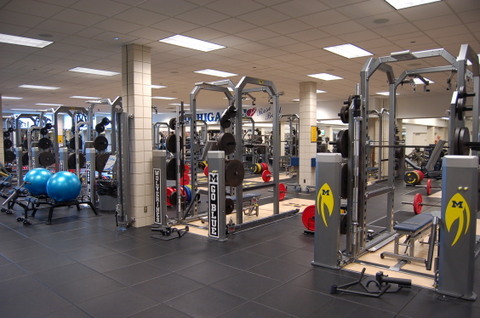 The ASAP~Athletic Strength And Power hub is located in Buckeye Country...that is Cincinnati, Ohio. Our training centers are located on Cincinnati's west side: ASAP @ The River's Edge, just across the Ohio River in Covington, Kentucky: The Workout @ Covington, and an adult personal training center: The Workout @ Adam's Landing in downtown Cincy. So, it was a little difficult for us to head up to, as Woody Hayes called it, "the School Up North".... The University of Michigan. But we did. The Michigan Wolverines football program has a new direction and is lead by Head Coach Rich Rodriguez as he arrived on the scene just a little after January 1st. Coach Rodriguez brought his staff, which was with him at the West Virginia Mountaineers program, and that included the strength and conditioning staff, too. 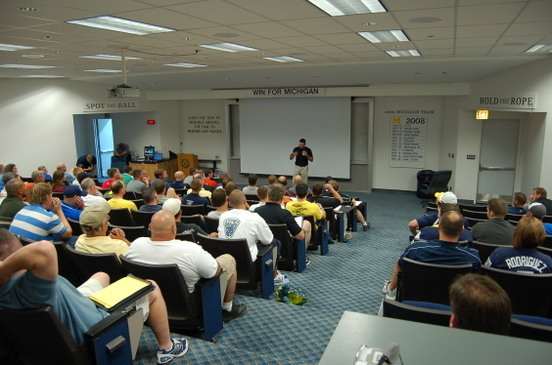 Well, the curiosity got to us, as we wondered what was going on up there.... so enjoy another ASAP Exclusive Podcast....this one with new strength and conditioning coach Mike Barwis, as we take an in depth look at the Michigan Football strength program. Click the Michigan logo above for Part 1 (8 minutes). I am interested in learning how to use this training method. Are there going to be any courses?